Measure flour into large bowl. Cut in shortening with pastry blender until mixtures resembles coarse crumbs the size of peas. Blend in enough buttermilk until dough leaves sides of bowl. Turn dough onto lightly floured surface. Knead gently 2 or 3 times. Cut with 2-inch floured biscuit cutter. Place on pan with biscuits almost touching. Bake at 500 for 8 to 10 minutes or until golden brown. 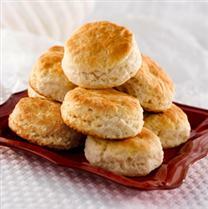 GARLIC CHEESE BISCUITS: Stir in 1 cup shredded Cheddar cheese before adding milk. Drop rounded tablespoonfuls onto prepared baking sheet. Bake as above. Combine 1/4 cup melted butter and 1/4 teaspoon garlic powder. Brush on warm biscuits. TO USE ALL-PURPOSE FLOUR: Combine 2 cups flour, 1 tablespoon baking powder and 1 teaspoon salt before cutting in shortening. Then follow directions above.